View pdf of pages 473-476. The page numbers are above each page. 474 INDIAN WARS AND PIONEERS OF TEXAS. forth, working threads, dark and bright, into the warp and woof, controlled by an impulse flowing from the unknowable center of the unknown. The same idea has, in later times, found expression in the deeply pious predestinarianism of Calvinism, the coldly callous indifference of fatalism, such popular expressions as " Man proposes and God disposes," and the lines "There is a destiny that shapes our ends, rough hew them as we may," and in a thousand other mental conceptions and forms of speech. To what extent each life is pre-ordered and the limits within which free-agency operates, we know not. We know, however, that the serf of Russia, until a few generations back, was born into conditions that he could never hope to alter, and that fixed, from its beginning, the general course and tenor of his life; that every man, however brilliant his inherited talents, however great the wealth that descends to him, however exalted the station into which he is introduced by the fact of birth, however free he may imagine himself to be to do as he pleases, is yet surrounded by limitations that (although as invisible as the air or thought itself) are, yet, as strong as forged and tempered steel and. that he can by no possibility break through. The efforts of the bird that beats its feeble wings against the bars of its cage are not more futile. Two boys are playing upon the village green. One will till the soil where his eyes first beheld the light and, passing quietly through the scenes of youth and manhood, descend through an uneventful old age to his place in the village church-yard where his dust and bones will mingle with those of his fore-fathers of many generations. The other will pass through many strange scenes and thrilling experiences, perhaps, by flood and field, and find his home and final lifework and final resting-place, in a land of which he has, as yet, not so much as heard the name. By mount, and stream and sea. Where are those dreamers now! O'er his low bed may weep. On a blood-red field of Spain. The last of that bright band. The truth is that no man can tell what the future has in store for him – what pleasures, what heartaches, what successes, what reverses, what triumphs, what disasters, or how he shall fare him battling amid the thousand and one cross-currents of circumstance. But of one thing there is a certainty and that is, that the man who makes the voyage of a long life, meets and overcomes its difficulties, keeps heart, mind and hands undefiled and achieves honorable success, has earned a patent of nobility that belongs to him of divine right and that entitles him to the confidence and esteem of his fellow-men while living and his memory to preservation from oblivion to which the undiscriminating hand of time seeks to consign all transitory things. In the early days of the present century there lived in the little town of Lublin, Poland, a sturdy lad, who, after years spent in travel upon three continents, was to make his home in Texas, and here exercise a wide and beneficent influence and leave his impress upon the communities in which he lived. We refer to the late lamented Simon Wiess, Sr., of Wiess' Bluff, Jasper County, Texas. with Gen. Houston and the other heroes, orators and statesmen of the Republic, when in the prime and zenith of their fame. In January, 1836, he was united in marriage to Miss Margaret Sturrock, at Natchitoches, La. She was a daughter of Wm. and Ann Sturrock, nee Miss Ann Swan, whose mother's maiden name was Miss Agnes Kerr, all of Scottish lineage. The Sturrock family came to America about 1830 and settled on the Hudson, remained there about two years and then went to New Orleans, from which place they moved to Natchitoches, La. In 1836 Mr. and Mrs. Wiess moved to Nacogdoches where he engaged in merchandising, a part of the time occupying the historic stone fort situated in that place. 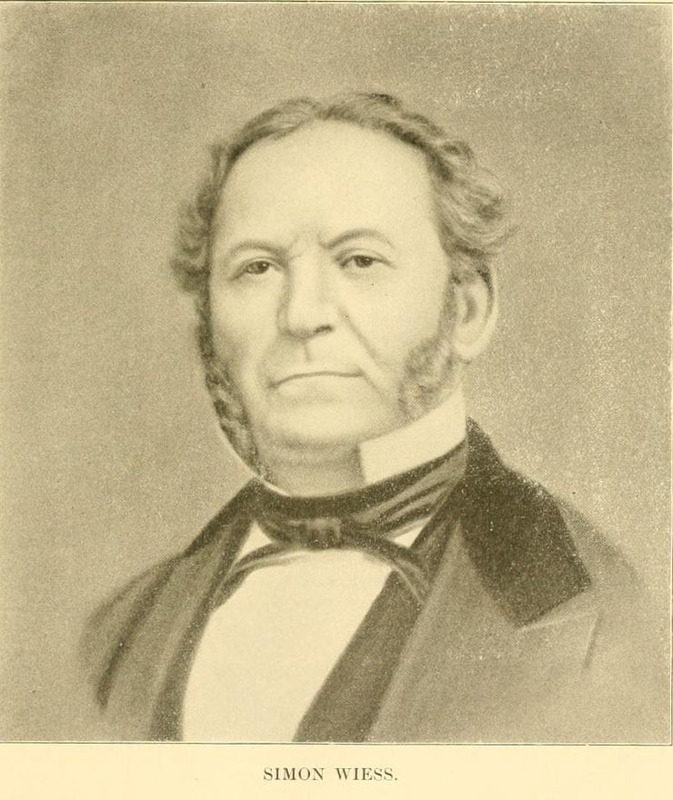 In 1838 he left Nacogdoches with his family and household effects aboard a keel-boat loaded with the first cotton ever transported down that stream to Sabine Pass, and disembarked at Beaumont where, and at Grigsby's Bluff, he merchandised until 1840, and then moved to Wiess' Bluff, in Jasper County, where he remained until his death, which occurred August 13, 1868. While living at Wiess' Bluff he was also engaged in merchandising, did a large receiving and forwarding business, handling most of the cotton raised in the section, and was interested in steamboating on the Neches river. He left six children: Pauline, who married Abel Coffin (deceased), she is still living at their old home in Jasper County; Napoleon, deceased and buried at Wiess' Bluff; Mark, William and Valentine, prominent mill-men largely interested in the Reliance Lumber Company, of Beaumont; and Massena, the youngest, who lives at Round Rock in Williamson County. In all his dealings with his fellow-men, whether as a traveler or trader in the Orient, an owner of vessels plying the pirate-infested waters of the Spanish Main – on the steppes of Russia, in the Indies, in Central and South America, in his counting-room, in Southern Texas – everywhere and always, he manifested a just, generous and manly spirit. 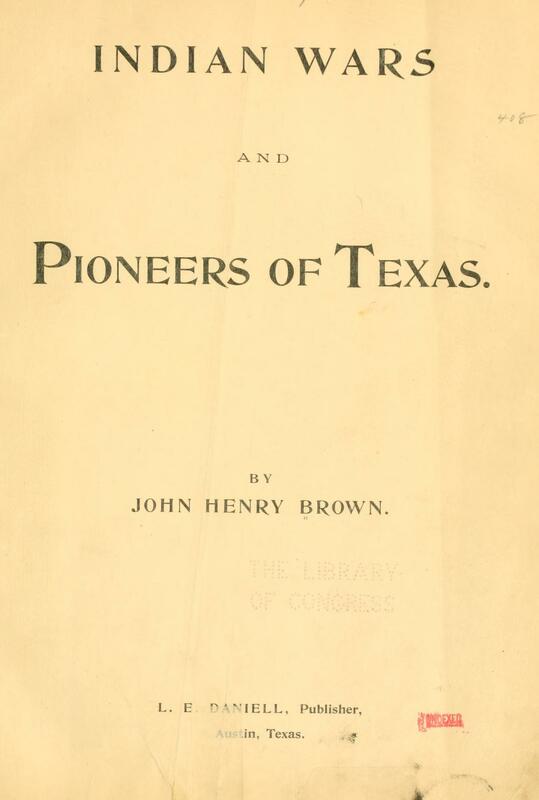 476 INDIAN WARS AND PIONEERS OF TEXAS. The perfect model of a commonwealth. Safe to triumphant victory; old or wounded. Was set at liberty, and freed from service. Marble, hewed for the temples of the gods. Their sepulchers; but man to man more cruel. Appoints no end to the sufferings of his slave." His was the true patriot's heart. He had a deep and intense love for the United States and free institutions. He hated tyranny, oppression and injustice in any form. He liberally rewarded those who served him. He was generous and true to his friends. His charity knew no fainting. He possessed none of that greedy and glutinous spirit that enables its possessor to fare sumptuously and with added zest unaffected by the starvation and the wails of the distressed which are bourne to him upon every breeze. He subordinated his desire for financial independence to the dictates of honor. He was true to every obligation as employer, citizen, husband, father and friend, and left behind him an untarnished name of which his descendants may feel justly proud. He died full of years, loved by many, respected by all. He sleeps with his fathers, a sleep that is the reward of a well-spent life. Peace to his ashes, and honor to the memory of his usefulness, kindliness and worth. Mrs. Wiess, for so many years his beloved counsellor, companion and helpmate, who cheered and sustained him in many an hour of trial and difficulty, a truly noble woman, died at Wiess' Bluff, May 17, 1881. The following obituary, written by E. L. Armstrong, of Irene, Hill County, Texas, is a fitting testimonial to her many excellencies of character. 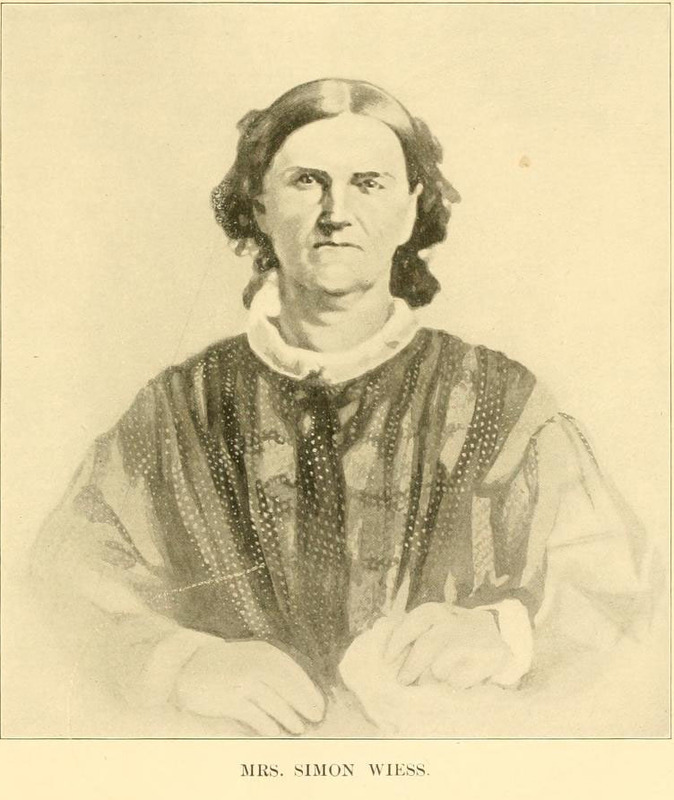 "Wiess – Died at Wiess' Bluff, Jasper County, Texas, May 17th, 1881, Mrs. Margaret Wiess. She was born in Scotland, near Dundee, June 12, 1814. Was married to Simon Wiess at Nachitoches, La., January 6th, 1836, with whom she lived happily until his death, which occurred in August, 1868. Gen. Sam Houston, Rusk and other noted men of the day. "She was the mother of six children, five of whom still live; the eldest died some years ago. "She was a woman of extraordinary endowments, possessing all the rare excellencies that combine to make the true wife, the devoted mother and a successful keeper of home and the affairs of home. "She was fully equal to the emergencies of life. "As a mother she was the embodiment of kindness, guiding her children by the law of love; their success in life is attributable to the care and culture imparted at home. "As a wife it was her chief joy to make her husband happy – to this end she lent her energies without stint, and her success was wonderful. "As a friend she was true, devoted and obliging. "She was truly benevolent to the poor and needy – never turning them away empty-handed. "Her great heart was touched when suffering befell her kind, often giving to those that were better able to help themselves. "She was reared a Presbyterian, but never united with the Church, not being situated so that she could do so. "She was a woman of prayer and loved her Bible. "I met her twenty-eight years ago and our acquaintance matured into mutual and abiding friendship; having spent many days and hours under her hospitable roof. "Last December I saw her for the last time on earth – worn and emaciated by age and disease. "She feared not the approach of death. "At her request I read for and prayed with her, and conversed with her in regard to the approaching end; she had no fears, but trusted in the atoning blood. "We are informed by her sons that her end was peace. "We are to hear no more the hearty welcome to her home, nor note the many acts of kindness performed to make the weary itinerant comfortable and happy. But we will remember her through all the days of our pilgrimage. "We extend to her children our heartfelt sympathy and invoke the blessings of heaven upon each one of them. "May they also be ready."